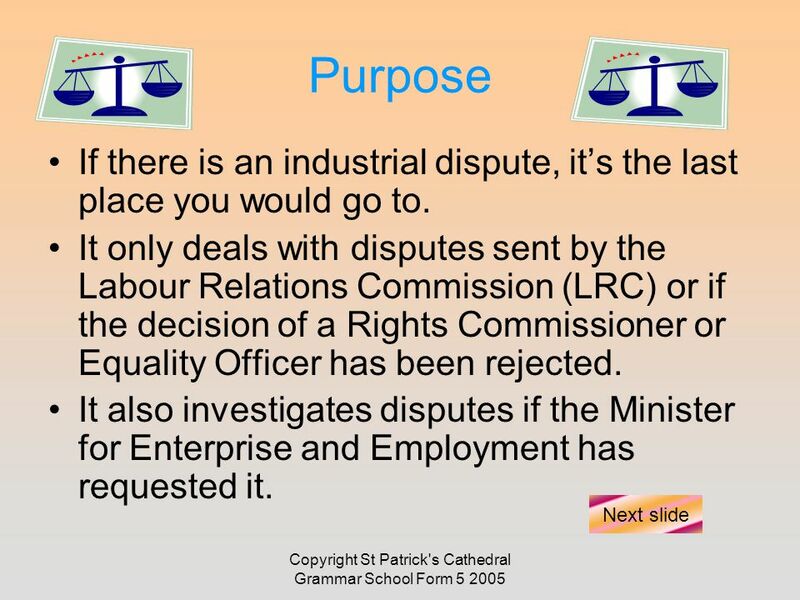 Copyright St Patrick's Cathedral Grammar School Form 5 2005 What is the Purpose of the Labour Court? The court of the last resort. Next slide. 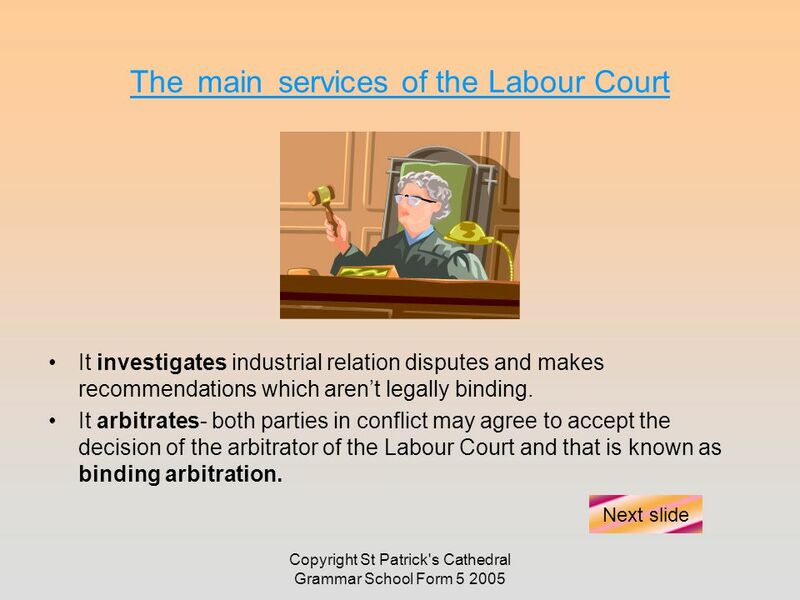 4 Copyright St Patrick's Cathedral Grammar School Form 5 2005 Other Services of the Labour Court Registers agreements made between employers and unions. These agreements become binding. Established a Joint Labour Committee (JLC): It is a forum for discussing minimum pay and working conditions in areas where not many workers have union protection such as part time workers and small hotels. It supports the Joint Industrial Councils (JICs): these bodies are voluntary and consist of employer and worker representatives. However, the decisions made by JICs aren’t legally binding. Download ppt "Copyright St Patrick's Cathedral Grammar School Form 5 2005 What is the Purpose of the Labour Court? The court of the last resort. Next slide." CHAP 3: CONFLICT IN THE WORKPLACE 1. WHAT ARE INDUSTRIAL RELATIONS This is the term used to describe the relations between the management of a firm and. EMPLOYEE RELATIONS. Formal relationship between employers and employees. Employee Relations may involve representatives rather than individuals. Chapter 4 Settling Disputes. Solving Disputes Conflict is inevitable - how do we handle conflict? Courts - disadvantages - expensive, can make problem. 8 May 2012Luc Ardies Presenting Buurtsuper.be Buurtsuper.be vzw is the UNIZO federation for the independent food retail and defends the interests of independent. Industrial Relations Act 1990 Next Slide. What is the difference in an employer and an employee? Employer is a person who pays one or more people to work. What Happens When Agreement Is Not Reached Conciliation : Either the union or the employer may ask the Ministry of Labour to appoint a conciliation officer. Can Access to Justice Promote Behavioral Change? The Experience of the Arbitration Council. (c) St Patrick's Cathedral Grammar School form Obligations of a Data Controller Obligations of a Data Controller. 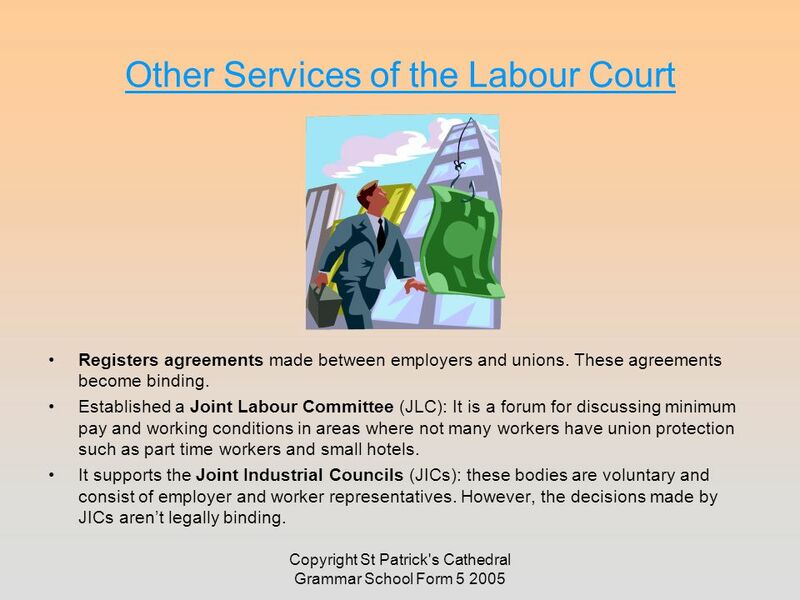 (c) St Patrick's Cathedral Grammar School Form What Is The Purpose Of A Joint Labour Commission (JLC) and A Joint Industrial Council (JIC)? ILO Standards and Principles on Labour Disputes Settlement Alain Pelce Senior International Labour Standards Specialist ILO Office in Moscow. Workplace Disputes Topic 4: Human Resources Strategies in human resource management. (c) St Patrick's Cathedral Grammar School Form Unfair Dismissal Act 1997. CONDUCTING SECTION 188A ENQUIRIES. Introduction The proposed amendments to section 188A of the Labour Relations Act may result in increased usage of the. 1 Current Labour Law 2011 Collective Bargaining Clive Thompson. THE NEW LABOUR LEGISLATION Employment Act No. 11 of 2007 Labour Instiutions Act No. 12 of 2007 Labour Relations Act No. 14 of 2007 Work Injury Benefits. MANAGERS AND PROFESSIONALS ASSOCIATION Main objective - to assist our members to obtain the very best from their employment. CHAPTER 1 The sources and institutions of employment law. Effective Employer -Employee Relations A2 Business Studies. E. Napp Organized Labor In this lesson, students will be able to identify characteristics of unions. Students will be able to identify and/or define the.